Cheryl devotes her skills to make each patient’s experience comforting. Cheryl has a customer service and fashion retail background which helps patients solve problems big and small and believes that customer service is the most important aspect of her job. Cheryl’s flare for style, her conscientiousness and patience, and her warm personality are what have resulted in her loyal following of devoted patients, who have followed her throughout her career at our office. They know that Cheryl will help them select the right lenses and best frame for their visual needs and to suit their personal style. Cheryl is also a proud “hockey mom” to Ethan and is celebrating her 23rd year anniversary this year with her husband Bill. 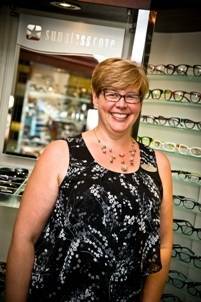 Cheryl proudly serves the community both at the office and in her role as Director of Events and Tournaments for Brantford Minor Hockey.